In a medium saucepan combine the sugar and water. Over low heat allow the sugar to melt, stirring until sugar has dissolved. Allow to cool. Blend cucumber, lime juice, mint leaves, and simple syrup and puree until smooth. *Pour 3 teaspoons of tequila into the Zoku Pour Cup**, and then pour the cucumber mixture in to measure 3 popsicles. Mix well. 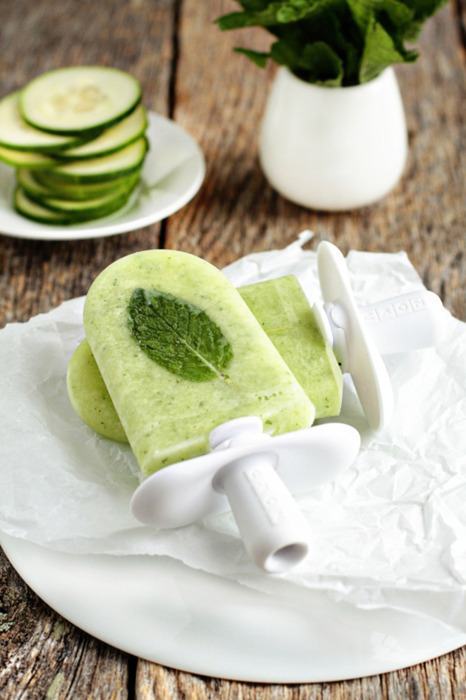 Using the Zoku Fruit Wand,** apply wet mint leaves to the side of the wall of the pop maker molds and a cucumber slice on the opposite side. Insert sticks and pour the cucumber mixture until you reach the fill line. Let freeze completely, then remove the pops with the Super Tool and enjoy. Repeat with remaining pops.